Missouri Attorney General Josh Hawley and U.S. Sen. Claire McCaskill shake hands following Thursday night's senate debate in St. Louis. U.S. Sen. Claire McCaskill answers questions during the debate. Attorney General Josh Hawley speaks during Thursday's televised senatorial debate. U.S. Sen. Claire McCaskill speaks during Thursday's televised senatorial debate. Missouri Attorney General Josh Hawley answers an audience member's question during a televised senatorial debate on Thursday. U.S. Sen. Claire McCaskill compliments Missouri Attorney General Josh Hawley's family. Missouri Attorney General Josh Hawley and U.S. Sen. Claire McCaskill debate on Thursday night. Democratic U.S. Sen. Claire McCaskill and her GOP rival, Missouri Attorney General Josh Hawley, sparred over how they would improve health care in an hour-long debate Thursday night that featured familiar themes. Hawley said McCaskill adheres to the Democratic Party stance and has, over 12 years, moved away from the views of her state, where voters went for President Donald Trump by 19 points. McCaskill emphasized her independence, as someone who will work with “anyone, anytime” to address the state’s needs. Afterward, both candidates were optimistic they had achieved their goals in the debate. Both said their policy differences were clear. Hawley cited their differing views on the EPA, a border wall between the U.S. and Mexico and tax cuts. “It’s between what the people voted for in 2016 and the party-line, liberal agenda that Sen. McCaskill has supported over and over,” he said. 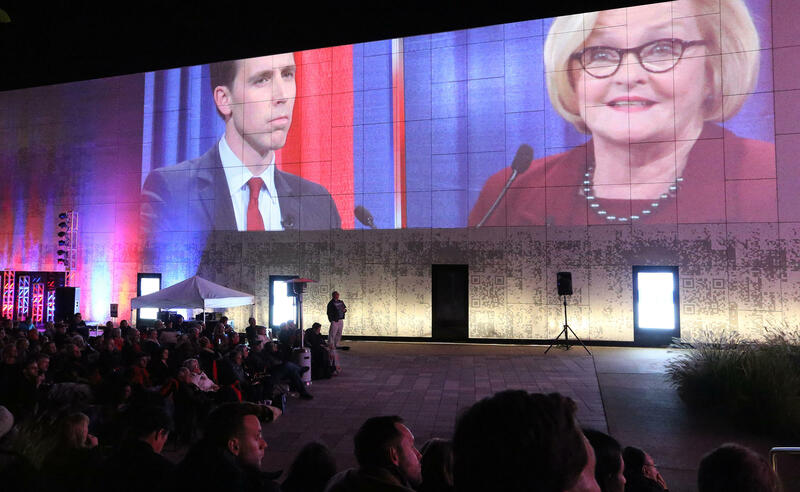 U.S. Sen. Claire McCaskill and Missouri Attorney General Josh Hawley debate at Nine Network of Public Media as people watch in a outdoor public viewing area in St. Louis on Thursday night. Health care – the contest’s top topic – took a sizable chunk of the debate’s time. But neither candidate broke new ground. Hawley said he’s sticking with his involvement in a federal lawsuit that would do away with the Affordable Care Act, including its provisions requiring insurance companies to cover people with pre-existing conditions without raising their premiums. Hawley said, however, he is committed to still protecting people with pre-existing conditions, and cited his young son’s chronic hip and joint problem as an example. “I think we should repeal and replace,’’ Hawley said, contending that the ACA is unaffordable and unworkable. “What we see from the Democrats is a full-throated defense of Obamacare,” Hawley said. McCaskill noted that, so far, the Republicans controlling Congress have yet to come up with a way to cover patients who have pre-existing conditions, and have instead focused solely on trying to repeal the ACA — also known as Obamacare. Hawley accused McCaskill of cutting more than $700 billion from Medicare, because that cut is part of the ACA. She countered that the $700 billion is actually a cut in insurance companies’ profits and is used to pay for the ACA’s mandates for free health screenings, such as mammograms and colonoscopies. If the ACA is repealed, she said, Medicare recipients also lose some drug coverage, because the ACA got rid of the “doughnut hole,’’ where recipients had to pay the total costs of their drugs until they hit a certain level of spending. Neither Hawley nor McCaskill said they believed that safety-net programs such as Medicare or Social Security were the main driver of the deficit, which rose nearly 17 percent in fiscal year 2018 and is expected to grow to $1 trillion. And both pledged that they would not make cuts to those programs. But they disagreed sharply on what caused the spike. McCaskill laid the blame squarely at the feet of the Republican tax plan Congress approved in 2017. While most of the questions focused on domestic policy, both candidates were asked how the U.S. should respond to the disappearance of Saudi journalist Jamal Khashoggi, a contributing columnist for the Washington Post. Khashoggi has not been seen since Oct. 2, when he walked into the Saudi embassy in Turkey to get needed paperwork for his upcoming wedding. Leaked intelligence information suggests he was killed by Saudi intelligence officers, possibly at the order of the country’s ruler, Crown Prince Mohammed bin Salman. Trump has faced harsh criticism for what some perceive as his soft response to Khashoggi’s disappearance. McCaskill said that “everything has to be on the table,” including sanctions against Saudi rulers, if it can be proven bin Salman was involved. Hawley said he supported Secretary of State Mike Pompeo’s demand for an investigation to determine the facts. A question from Maria Watson of Arnold focused on a concern for residents across Missouri: gun violence. Hawley pledged his support for expanding background checks to include a person’s mental-health records. He blasted McCaskill for voting against a proposal to include those checks because it wasn’t what her party supported. North St. Louis County resident Tyale McNary asked both candidates what they would do help bridge the divide between African-Americans and law enforcement. That issue has been especially vital in the St. Louis region four years after Michael Brown’s shooting death by a police officer set off waves of protest in and around Ferguson. Neither candidate really answered a question from Brentwood resident Tim Rudolph, who wanted to know what they would do to both protect the climate and ensure that corporations were not unfairly burdened by regulations. “Climate change is real, it’s time we trust our scientists, it’s time we accept some reasonable regulations to keep our waters clean and our air pollution free, and obviously, turning to our alternative fuels is very important,” McCaskill said, although she did not specify what types of regulations she would support. Hawley used the question to knock McCaskill again for being out of touch with the needs of Missouri businesses, especially farmers. Missouri voters in August struck down the state’s so-called right-to-work law, which would have barred unions and employers from requiring workers to pay dues as a condition of employment. It’s unclear whether the Republican-controlled Missouri General Assembly will try to approve the law again. McCaskill accused Hawley of dodging the question, pointing out that a major donor to his 2016 attorney general campaign, Joplin businessman David Humphreys, is a stout right-to-work supporter. She emphasized that she is opposed to the policy. “I don’t think he wants to say anything different from the president, because he’s worried what happens when he says something different from the president,” McCaskill said. Hawley has made no secret about tying his campaign to Trump. Whether Missourians are still supportive of the president could be a pivotal factor in who prevails in the Nov. 6 election. Both candidates were asked about whether they support Trump’s push for a physical wall separating the border between Mexico and the United States. McCaskill said that border-security personnel have been asking for better technology — and better lateral roads to do their jobs. She went on to say that there’s some legal problems with building barriers — including litigation over taking farm land. Hawley said he emphatically supports funding and building a border wall. McCaskill responded, in part, that she’s received the endorsement of the union that represents border-patrol agents. Aimee Geary, a 39-year-old paralegal from St. Louis who was in the outdoor audience watching the debate in the Public Media Commons in St. Louis, said she came into the debate knowing she will support McCaskill in November and she was pleased with her performance. Overall, Geary said the debate was what she expected. She said she walked away from the debate with her opinion unchanged. Nick Cummings, 18, came to watch the debate from St. Charles, where he’s a high-school student at Francis Howell Central High School and a volunteer in a Hawley campaign office. Jacob Wilson was a member of the pre-selected audience inside the debate. Wilson is a 32-year-old resident of the Tower Grove South neighborhood of St. Louis and the Missouri director of the Campus Election Engagement Project, a non-partisan student-engagement group. He said he has “a pretty clear idea of who I’m going to be supporting in November,” but declined to indicate which candidate that will be. The race is critical to the efforts of both parties to control of the Senate — the nonpartisan Cook Political Report rates the race a toss-up — something confirmed by the amount of money pouring in and out of the contest. Hawley heads into the final 18 days of the election with slightly more cash on hand than McCaskill, although she was able to outraise him significantly. McCaskill has also spent more money on the race — mostly on TV ads. Outside groups are spending far more than either candidate. The nonpartisan Center for Responsive Politics’ latest tally says outside spending in the contest has reached just over $52 million, a total that does not include money spent by so-called “dark-money’’ groups, which do not have to identify their donors. The race has been close since the beginning of the year, when a Republican poll put Hawley up by four points. Real Clear Politics’ polling data now has the race at a statistical dead heat. St. Louis Public Radio, along with the Nine Network of Public Media and 5 On Your Side, sponsored the debate. McCaskill and Hawley are scheduled to debate in Kansas City Oct. 25. Missouri Attorney General Josh Hawley's closing statements at Thursday's Senate debate. U.S. Sen. Claire McCaskill's closing statements at Thursday's Senate debate. Reporters Abigail Censky, Jason Rosenbaum and Jo Mannies contributed to this story. It was less than two years ago that Josh Hawley did something no other Republican has accomplished in 28 years: Prevail in an attorney general’s race. This November, Republicans are banking on Hawley to accomplish another milestone in defeating U.S. Sen. Claire McCaskill. It’s an outcome that could determine whether the GOP retains control of the U.S. Senate and showcase whether Missouri is completely out of reach for the Democratic Party.